Packaged | Metro Services Inc.
We offer a wide array of packaged burners for commercial and industrial applications, designed to offer the utmost in reliability, efficiency and performance. The packaged system eliminates the need for lengthy engineering and design time. Our systems come completely ready to go. Simply add power and fuel to you control system, and the burner will do the rest. 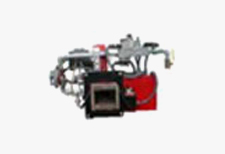 Recirculation High Temperature (RHT) indirect air heating burners are designed to heat recirculation ovens and dryers where the products of combustion must be isolated from the process air stream. They are also excellent for use in industrial space heating systems. These burners feature an industry proven burner, firing chamber and exhaust tube assembly as a single unit for easy installation and optimum performance. Pre-packaged, pre-piped complete assembly. Compact size. Can be adapted for special physical arrangements. FM and IRI gas trains available. 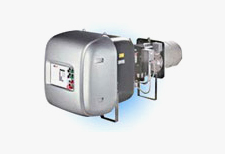 Nominal thermal capacities range from 500,000 to 6,000,000 Btu/hr. Twelve sizes — two lineal heat rates — 1,000,000 and 2,000,000 Btu/hr per foot length of burner gas manifold. Turndown ratios up to 40:1 depending upon burner application and selection. Gas-only modulation with constant air, high-low, or on-off controls are available. Burner design produces a wide and relatively short flame. PP burner is ideal where chamber length is restricted. Maximum flame lengths for 1,000,000 and 2,000,000 Btu/hr per foot inputs are 28″ and 40″ respectively. Meets NFPA standards including double solenoid pilots on the pilot gas line. Supplied for operation on natural gas or propane. Can be supplied to operate with other gas types. Complete pre-wired flame safeguard. The electrical enclosure and all internal components are either UL Listed or UL Recognized. Each burner can be optionally fit with complete diagnostic equipment for instant identification of any problem for minimum downtime. Easy to install and maintain. All parts of the burner, including the gas manifold and combustion head can be removed without taking the burner off the mounting flange. Easy access to the gas manifold and combustion head through the rear access panel. Easy access to the gas nozzle, spark plug, and flame sensor. Air filters are available for dirty environments. TEFC Motor (standard) and ODP motors are available. Can have a continuous running blower for special applications. Pre-built burner packages are fully tested and the operation of all components are checked before shipment. Can be supplied without gas train components. Pre-packaged, pre-piped complete assembly. The TFR burner series has been designed with a small “footprint” allowing mounting in applications where other burners may not fit. FM and IRI gas trains available. TF burners are intended for applications with “conventional” sized firing tubes with diameters up to 12″ and length to diameter ratios up to 80:1 depending on tube diameter. TF burner nominal thermal capacities range from 170,000 to 3,300,000 Btu/hr. TFR burners are specifically designed to maximize the heat release in small diameter tubes 2-1/2″ through 8″ and length to diameter ratios up to 150:1. 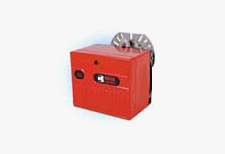 TFR burner nominal thermal capacities range from 240,000 to 2,600,000 Btu/hr. Depending on immersion tube selection, TF and TFR burner applications can produce thermal efficiencies of over 80%. To prevent overheating of the TFR burner components and immersion tubes at high firing rates, the burner has been designed with a split combustion cone head where air is introduced into the flame at three points to provide cooling. The firing tube is cooled so it will not discolor or blister paint including the surrounding area and mounting flange of equipment. Meets NFPA standards including double solenoid pilots on the pilot gas line. Supplied for operation on natural gas or propane. Can be supplied to operate with other gas types. Complete pre-wired flame safeguard. The electrical enclosure and all internal components are either UL Listed or UL Recognized. Each burner can be optionally fit with complete diagnostic equipment for instant identification of any problem for minimum downtime. Easy to install and maintain. Air filters are available for dirty environments. TEFC Motor (standard) and ODP motors are available. Pre-built burner packages are fully tested and the operation of all components are checked before shipment. Can be supplied without gas train components. Quality engineered to Riello’s world-class standard, 40-Series gas burners are built for maximum uptime. Riello 40-Series high-efficiency burners not only deliver low energy consumption and quiet, worry-free performance, they’re the most reliable combustion technology on the market. And Riello 40-Series gas burners offer a host of advanced features – such as durable, lightweight, compact construction; an integrated electronic control box with interrupted ignition; and an automatic air shutter that eliminates heat loss and enhances efficiency. 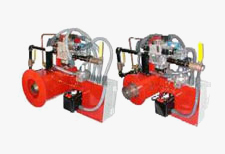 Easy to install and service, and backed by coast-to-coast support, Riello 40-Series gas burners are available with firing rates from 38 to 900 MBtuh to handle a complete range of residential and light-commercial/industrial applications. Quality engineered to Riello’s proven world-class standard, Modubloc MB SE gas burners are built for maximum uptime. These modulating industrial gas burners are based on a simple, integrated design that provides high-efficiency, low-noise operation while significantly reducing fuel and maintenance costs. And Riello Modubloc burners offer a host of standard features – like compact, die-cast aluminum construction; an inline fan and combustion head; and an innovative chassis design that makes installation and servicing easy. Modubloc MB SE burners incorporate Riello’s unique electronic control technology which provides for a high modulation ratio throughout the firing rate range, as well as PID control of the generator temperature or pressure. Riello Modubloc MB SE gas burners are available in firing rates from 3,650 to 34,120 MBtuh, to handle a broad range of demanding applications such as industrial boilers and steam generators. Quality engineered for the North American market to Riello’s proven world-class standard, R-series gas burners are built for maximum uptime. These compact burners are based on a simple, integrated design that provides high-efficiency, low-noise operation while significantly reducing fuel and maintenance costs. And Riello R-series gas burners offer a host of standard features — like compact, lightweight, die-cast aluminum construction; an integrated control panel, and innovative slide bars that make installation and servicing easy. 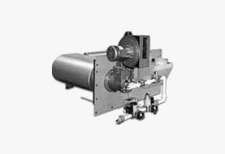 Riello R-series gas burners are available in firing rates from 198 to 8,673 MBtuh, to handle a broad range of commercial, industrial and process applications. Offered in a variety of configurations with various optional accessories, our RS models deliver uncompromising performance and reliability.